Warm scent of Cedar, the sweet pleasing scent of Sweetgrass and clean scent of Sage. Relaxing, refreshing and uplifting. 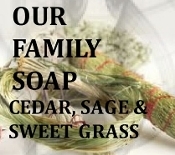 Again combined in our basic soap to leave your skin clean and soft. Olive oil, coconut oil, palm oil, Sage, Sweetgrass, Cedar EO, coco butter and Vitamin E.